Blog to End the Occupation: "If you truly want to help the Palestinian people, I urge you to listen to what they are asking for." "If you truly want to help the Palestinian people, I urge you to listen to what they are asking for." 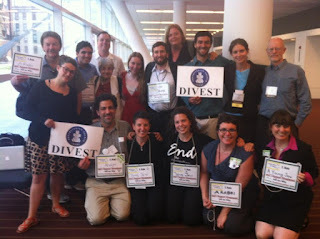 Our National Organizer Anna Baltzer gave the following testimony to the Presbyterian Church (USA) Middle East Peacemaking Committee on Monday, July 2, 2012 regarding divestment. She was serving as a Resource Person for the Advocacy Committee on Racial & Ethnic Concerns. If you are interested in learning more about church divestment efforts as well as other BDS campaigns in the United States, please register for our 11th Annual National Organizers' Conference taking place September 21-23 at St. Louis University. I defer to the Mission Responsibility Through Investment committee to answer your questions regarding the internal process of engagement with the companies leading to the recommendation to divest. Coming from my perspective as a Jewish American who has lived in Palestine, I can speak to the two other main concerns I have heard regarding Jewish-Christian relations and investment being a positive alternative to divestment. Friends, I am not up here as a Jew to tell that it’s okay for you to divest. Because you do not need my permission to do whatever you think is the righteous thing to do. You don’t need anybody’s permission. I realize that divestment is controversial. That’s okay. Slavery was controversial. The Church was divided. Desegregation was controversial. Especially in the South, people were afraid of damaging relationships if they spoke out for desegregation. But the Presbyterian Church supported an end to segregation before it was common. I urge you to honor that legacy by acting today out of love and compassion rather than fear of what others will say. You are being told that action against the occupation will estrange you from the Jewish people. But the occupation is fundamentally contrary to our shared values of equality and justice. There is nothing Jewish about racial profiling with Hewlett Packard bioscanners. There is nothing Jewish about protecting stolen land with Motorola technology. There is nothing Jewish about demolishing Palestinian homes with Caterpillar bulldozers. And to claim that ending cooperation with these human rights violations means ending cooperation with Judaism, or Jews, draws a very dangerous parallel. There is a sea change happening. Jews are divided on this issue. You have to follow your own conscience. Regarding the idea of investment as a positive alternative to divestment, let me point out first that there is nothing neutral about profiting from the destruction of Palestinian homes and schools, as you are today. To stop profiting from those things, to divest, is not negative -- it’s positive. Investment can also be positive, but it should be practical. No Palestinian economy can endure without access to land, water, goods, or labor. Checkpoints using HP bioscanners prevent workers from reaching work or transporting products. Settlements surrounded by Motorola cameras make it impossible for Palestinians to reach their land and resources. And anything you build can be destroyed in a flash with Caterpillar bulldozers. For 170 years, your church has chosen the model of mission in partnership rather than missionary work, recognizing the importance of listening to the voices and choices of those you are trying to help. Why do mission in partnership in Africa and South America, but not in the land where Jesus walked? Right now, the Palestinians are not asking for you to invest in their economy. They are asking you to stop investing in and profiting from their suffering. 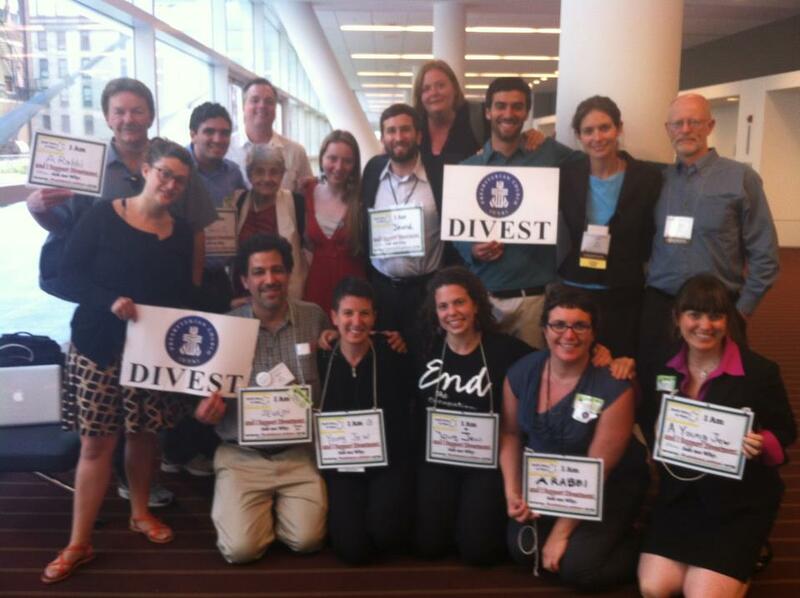 They are asking you to engage in divestment, a time-tested, nonviolent, faithful act of love. Giving charity can also be loving. But dismissing Palestinian voices is not loving. It’s patronizing. If you truly want to help the Palestinian people, I urge you to listen to what they are asking for. Thank you to the Israel Palestine Mission Network and Jewish Voice for Peace for ideas on some of the above talking points.